Rehabilitation -the use of therapy and exercise to restore lost functionality and help people to remain active members of society—is increasingly seen as a valuable field of medical endeavor. Rehabilitation is the domain of the physical therapist. The Department of Physical Therapy provides theoretical and practical training, and also teaches students how to be compassionate and sensitive to the needs of patients. Physical therapist qualifications lead to careers in a range of fields including health, welfare and sport. A sound theoretical and technical understanding is predicated on analysis of the patient's condition, which is studied from Year 1 onwards. There is a strong emphasis on clinical training components throughout the course to hone practical skills. The curriculum also teaches students how to be sensitive to the needs of the patient and how to work effectively as part of the health care delivery team. In Year 1 students learn the fundamentals of physiotherapy. The first half of the year is spent on introductory subjects and cultivating compassion and sensitivity, while the second half of the year focuses on basic concepts in medical science. In Year 2 students learn about symptoms and conditions that can be treated with physiotherapy, and study evaluation techniques for typical conditions via exercises involving clinical evaluation, the basis of physiotherapy. In Year 3, students perform physiotherapy evaluations at actual hospitals and clinics. The curriculum includes an optional overseas trip to the United States (also available in Year 4), which cultivates an international outlook and understanding of practical basics through observation of the health care system. Year 4 consolidates the content of the previous three years through extended clinical simulation exercises. Students practice physiotherapy on actual patients and prepare for the national accreditation examination with colleagues. The physiotherapist uses direct physical contact to assess and treat the patient. As such, the physiotherapist needs to have a solid understanding of the structures and functions of the human body. In Practical Anatomy, students learn the location and role of the various muscles, bones and nerve systems using a combination of model skeletons and textbooks. The instructor provides a demonstration, and students then pair off to practice diagnosis on one another. "This subject gives students the confidence to identify every bone and muscle in the body," says Seki. "It's wonderful when someone discovers a bone or muscle that they've only ever read about in the textbook. It's also important for students to see what it's like to be on the receiving end of physiotherapy treatment. You don't want your patients to experience pain, so you have to learn to adjust your use of force and pressure. We're also very strict about the correct use of instruments." 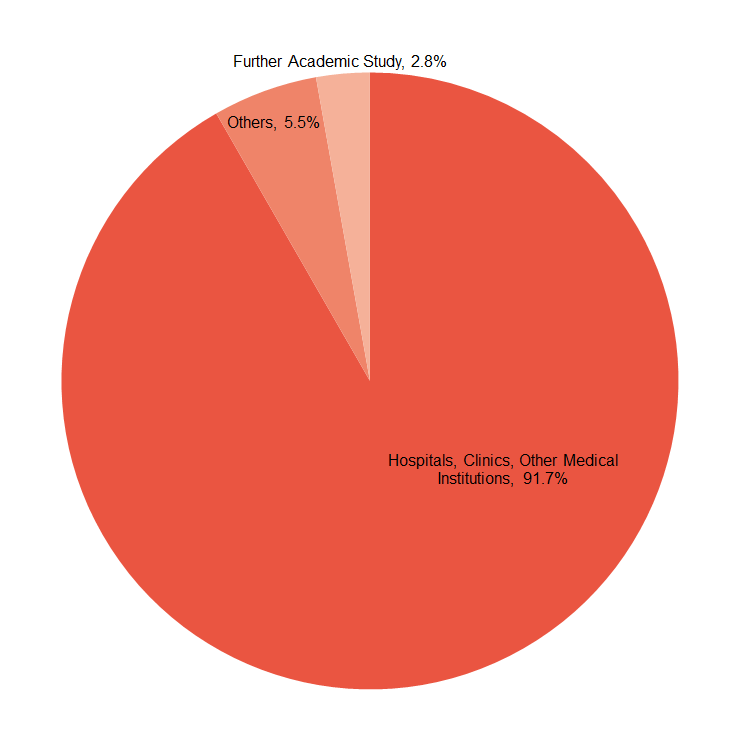 A large majority of students work at medical institutions following graduation.